Each summer the KBS LTER supports students to participate in the Research Experiences for Undergraduates (REU) program, funded by the NSF. This is part of a larger undergraduate research program at KBS. Gabriela Sinclair is studying at The College of Charleston. She wrote about her REU experience working with KBS LTER PhD student Kate Glanville in Phil Robertson’s lab. 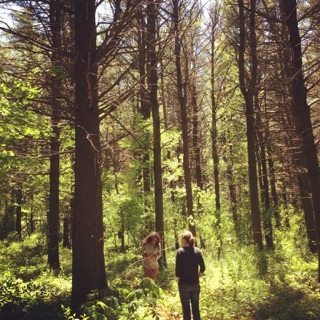 KBS LTER REU Gabriela Sinclair with her mentor Kate Glanville in the LTER conifer forest collecting data. First of all, the way you learn in school is drastically different than research. There’s no test to cram for, no professor lecturing with a slide show for an hour, there isn’t just one right answer, scientists aren’t walking around in lab coats all day, and there isn’t always a pristine lab. In my experience, you have to be a team player who solves problems and is understanding. I arrived from Charleston, South Carolina into Kalamazoo and was instantly greeted with a warm smile from ‘The Director’. Since this was my first time in Michigan and first intensive research experience, I was filled with anxiousness. Her calm and warm demeanor immediately put me at ease. She effortlessly carried a fun conversation the entire car ride back from the airport to bring me to my new destination that I would call home for the next 12 weeks. The Kellogg Biological Station (KBS) is located in a small town named Hickory Corners by lush green pastures on Gull Lake. There’s a strong sense of community; everyone is friendly and helpful. I was mentored by Kate Glanville, a PhD student in the department of Plant, Soil and Microbial Sciences at Michigan State University. She is part of the Robertson lab which focuses on the many processes of the nitrogen cycle and greenhouse gas emissions. This lab is filled with scientists whose kindness and vast knowledge made coming into work inspiring. In between rows of corn on the GLBRC where data was taken for Gabriela’s research. 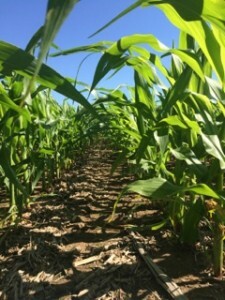 Straight away, I was introduced to my project: investigating greenhouse gas fluxes from agricultural row-crop ecosystems in the Great Lakes Bioenergy Research Center intensive site, a biofuels cropping system experiment established in 2008 at the KBS Long-Term Ecological Research site. To begin our project, we designed and created rainfall manipulation shelters. We used these shelters to treat soil in-between corn rows by exposing them to the same amounts of rain, but at different times. My project was to measure how light, moisture, and temperature was affected by the design of our rainfall manipulation shelters. I measured these variables with temperature/ light sensors and a soil moisture probe. I spent most of my time working in the field, making graphs and entering data. There was never a dull moment – I had such a great time working in the woodshop, running to the hardware store, and helping build an integral aspect of climate change research. I loved the structure and all the commotion of people going in and out of labs and field sites (wearing sandals nevertheless!). Getting to work outside often confirmed my strong desire to continue to be outdoors as much as possible. Using the ingredients listed above, I learned how to work with others, communicate my science more confidently, speak up, and ask questions. Most importantly, I learned how to take instruction and be able to apply it in the field. This summer trained, motivated, and molded me into a scientist that asks practical questions with the intentions of trying to make the world a better place. I will most likely continue to pursue a life as a scientist, equipped with the experience I gained here. 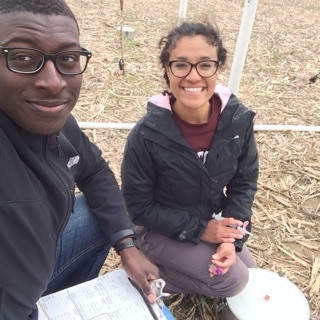 Gabriela and KBS intern William Davie in the field taking greenhouse gas samples.